The State Department on Thursday denied that the United States had softened its approach toward North Korean denuclearization, as U.S. Secretary of State Mike Pompeo heads to Pyongyang hoping to hammer out a roadmap for its nuclear disarmament. [post_ads]"Nothing could be further from the truth. Our policy toward North Korea has not changed," State Department spokeswoman Heather Nauert told reporters on the way to Pyongyang. "We are committed to a denuclearized North Korea and Secretary Pompeo looks forward to continuing his consultations with North Korean leaders to follow up on the commitments made at the Singapore summit," she added. President Donald Trump told reporters on Thursday he got along "very well" with North Korean leader Kim Jong Un at their June 12 summit. "I really believe that he sees a different future for North Korea. I hope that’s true. If that’s not true we’ll go back to the other way," Trump said aboard Air Force One as he flew to Montana. Pompeo will spend a day and a half in North Korea on Friday and Saturday on his third trip to Pyongyang, and his first since the unprecedented summit between Trump and Kim. At the Singapore summit, Kim made a broad commitment to "work toward denuclearization of the Korean Peninsula," but has made no mention of how or when Pyongyang might give up a nuclear weapons program that threatens the United States and its allies. Ahead of the Singapore summit, Pompeo said Trump would reject anything short of "complete, verifiable and irreversible denuclearization." But following talks on Sunday between U.S. envoy Sung Kim and North Korean counterparts, this "CVID" language appears to have disappeared from the State Department lexicon. It says pressure will remain until North Korea denuclearizes, but in statements this week, has redefined the U.S. goal as "the final, fully verified denuclearization of (North Korea) as agreed to by Chairman Kim." Some U.S. officials and experts have said the change in language amounted to a softening in the U.S. approach. 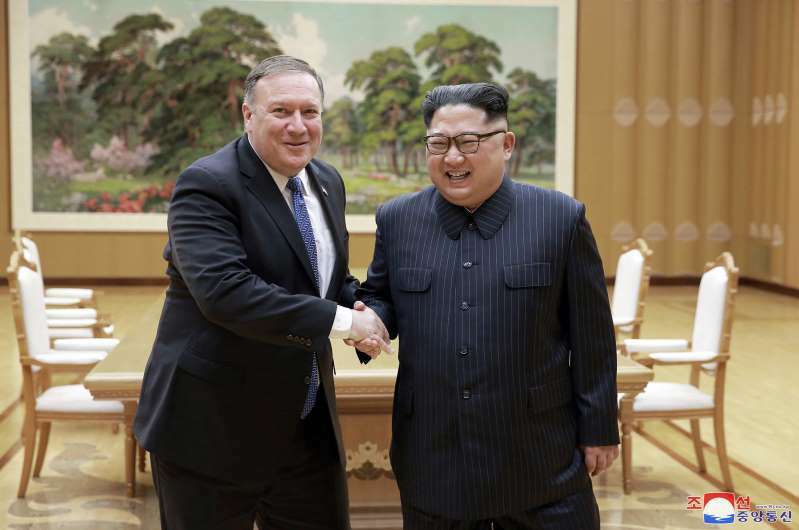 After his departure from Washington on Thursday, Pompeo tweeted: "Looking forward to continuing our work toward the final, fully verified denuclearization of #DPRK, as agreed to by Chairman Kim. Good to have press along for the trip."